This entry was posted in General News and tagged alan alda, margaret marshall, writing conference on June 21, 2011 by Wire Eagle. Margaret Marshall, Auburn University’s Director of University Writing, recently joined 35 university leaders from around the country at a conference at New York’s Stony Brook University to examine ways scientists could more effectively communicate with the public. 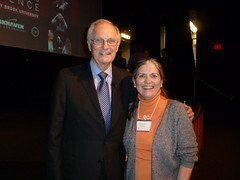 The keynote speaker was actor Alan Alda, a visiting professor at Stony Brook who describes himself as a lifelong science lover. The four-day Communicating Science Summer Institute was conducted by Stony Brook’s Center for Communicating Science as it seeks to develop ways scientists can speak and write clearly and conversationally about their work to non-scientists. It was supported by funding from The Kavli Foundation and the U.S. Department of Education.